Making my Best of List for 09 earlier this year I never properly reviewed A Prophet. So to build awareness of this excellent film’s release on DVD and Blu-Ray I will give it the proper review it deserves. 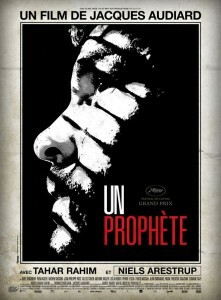 A Prophet might be the best crime film of the last decade and is a near perfect film on almost every level. Malik, 19, arrives to prison ready to serve a 6 year sentence for beating up a cop. A repeat offender, this is the first time that Malik has committed a crime of the age to be sent to the real prison and things don’t start off well for the young inmate. Illiterate and uneducated, this half French/half Muslim kid is despised by both factions that the prison naturally split into based on ethnicity. After getting pushed around a bit, like every new inmate seems to be, Malik’s situation gets dire in a hurry. A group of Corsican gangsters who run the prison, led by César, “volunteer” Malik to kill a Muslim inmate that is going to testify against the Corsican’s on the outside. If Malik isn’t up to the task, the Corsican’s will kill him instead. I will spoil no more but that recap only sums up the first twenty minutes or so of the film and Malik’s journey goes well beyond being a lackey for the Corsicans. Malik’s journey is epic and engaging as he learns his way around prison life and works his way slowly into greater and greater prominence. It is tough to write about this film as what makes this film great is the unexpectedness of Malik’s journey and I don’t want to spoil things any further. But any fans of crime or prison films will quickly fall in love with this rich world that Jacques Audiard has created in A Prophet. The film is full of twists and turns, suspense builds with every new development, and I guarantee it will shock on more than one occasion. The scope of the film is also greater than you would think for a film set in a prison and it naturally progresses outside the walls. The only thing that I could really possibly say that is negative about the film is that it is a bit tough to keep track of whose name is what. The second time through this was much easier to follow though, maybe I was just tired or something the first time? The pacing and style really help keep the potentially mundane prison environment lively and interesting, while Alexandre Despalt’s score is a real marvel that fits beautifully with the images on the screen. Speaking of Despalt, he has had an amazing run as of late. Between this, Fantastic Mr. Fox, The Ghost Writer, and Benjamin Button he has been on a role and I can’t wait to hear his work in Harry Potter this winter. Back to the film, also dabbles in the “unreal” (for lack of a better term) from time to time and I don’t quite know what we are supposed to take from the origin of Malik’s nick name and his constant visitor. But rest assured this element never takes away from the stark reality this world Audiard has crafted for the viewer and it will get your wheels turning as to whether something else is inside Malik. Breaking out as Malik is Tahar Rahim whose quiet submission slowly evolves into quiet confidence over the course of the film and Rahim does it with amazing subtlety. Before you even realize it Malik is three steps ahead of you and Rahim can’t be applauded enough for playing the transition so well. Getting a lot more of a role to chew on is Niels Arestrup as César and he smolders underneath his calm exterior. You get tense just from never knowing when he is going to explode. It’s the quiet moments for César are where Arestrup really gets to shine, as he gives us so much to absorb about the character without ever uttering a word. Adel Bencherif and Reda Kateb also turn in some very good supporting work as Malik’s friends while also providing some interesting characters to populate the prison. In the end, A Prophet is about as good as you can make a film about prison or crime and will go down as a classic of the genres for years to come. Nominated for an Academy Award this past awards season A Prophet might have wandered on to some of you guys’ radar already. But if you aren’t aware of this phenomenal film, rush out now to check this one out. In my Best of 09 article earlier this year I placed this film at #11 and mentioned that it “might deserve to be higher on the list.” Having now seen the film again on Blu-ray I can confirm that notion was right and I would easily put this up with the five best films of 09.